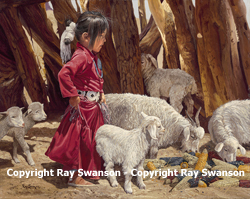 "Out in the Goat Corral"
$25.00 additional for shipping and handling each giclée. 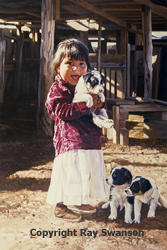 The revolutionary new giclée (ghee-clay) reproduction on canvas is as rewarding visually as it is technically amazing. 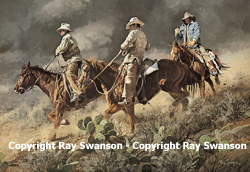 These brilliantly sharp giclée reproductions are simply the closest duplication of an original artwork that is possible. 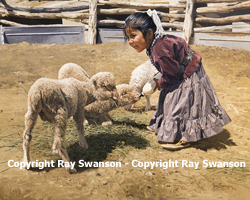 The word "giclée" is French and means "spray of ink." 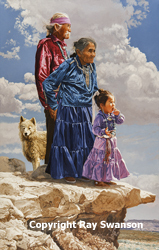 Once printed on canvas, the image is comprised of almost 20 billion droplets of richly saturated ink. The ink has a 75-year light fastness and does not need to be glassed. 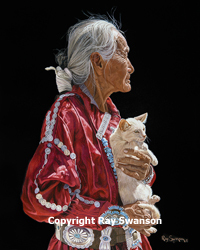 These beautiful giclées of Ray Swanson paintings must be seen to be appreciated. They look very close to an original painting when on your wall. Please order the giclées on our Contact Us form. Each piece is mounted on canvas with a 1" deep stretcher bars, gallery wrapped, stretched, wired and ready to hang.